Third Place - Landon and Jennifer Williams - 908 Wilderness Ave.
Pincher Creek's community spirit has been well displayed this Christmas season, with imaginative and colorful light displays on almost every block. On Wednesday evening December 9 judges toured the town to decide this year's Winter Lights Competition winners. The competition was once again sponsored by Pincher Creek's Communities In Bloom (CIB) committee and Perfect Posies Greenhouse. This was the sixth iteration of the event, which began in 2010. Displays were judged based on overall impact, visual appeal, uniqueness and variety of decorations. Safe, energy efficient and environmentally friendly options were encouraged. Prizes were awarded for first, second, and third places, three honourable mentions, and three best groupings (which included 8 homes total). An awards ceremony was held at Perfect Posies a week after the judging on the evening of December 16. Lisa Dupuis said her first place Canyon Crescent effort would not have been as good of a display without the whole hearted effort her family put into making it extraordinary, including the efforts of her husband Jerry, her daughter Sienna, and her son Braeden (who was unable to attend the awards ceremony). The Dupuis family earned and Honorable Mention last year. Second place went to Shirley Johnson's home on Albert Avenue, and third place went to Landon and Jennifer Williams of Wilderness Avenue. 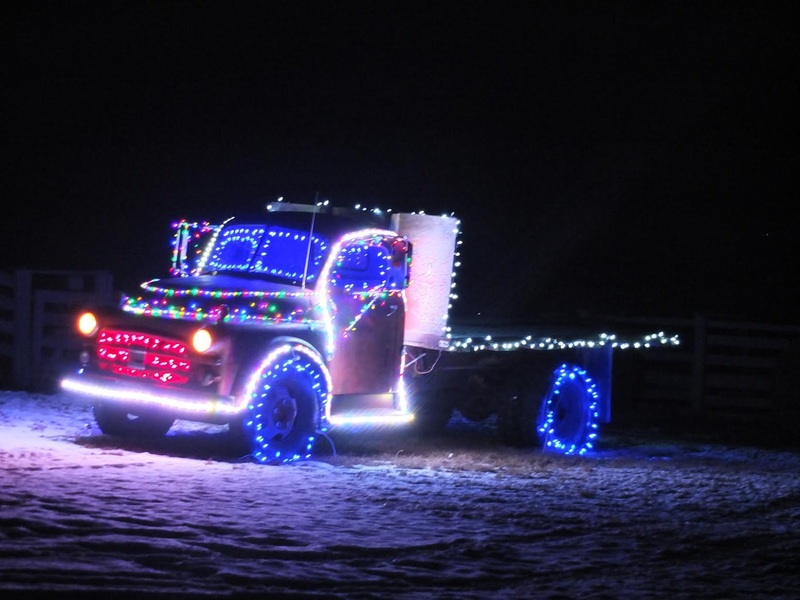 Related: Pat Moskaluk too the above photo of an elegantly decorated truck parked adjacent to Highway 6 (out of the contest's range, but still beautiful) approximately four miles south of town near the Alberta Ranch Road.